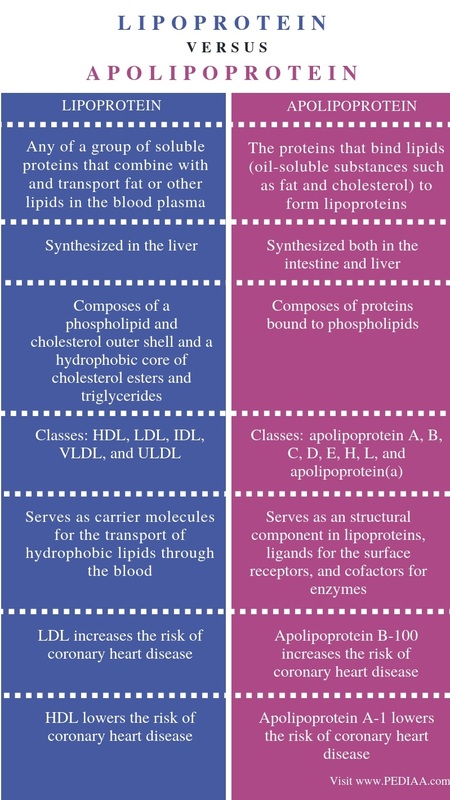 The main difference between lipoprotein and apolipoprotein is that lipoprotein is an assembly of molecules whose function is to transport hydrophobic lipids in watery media including water and extracellular fluid whereas apolipoprotein is a protein bound to lipids in order to form lipoproteins. Furthermore, several types of lipoproteins occur in the blood including HDL, LDL, IDL, VLDL, and ULDL (chylomicrons) while apolipoprotein A, B, C, D, E, H, L, and apolipoprotein(a) are the classes of Apolipoproteins. Lipoprotein and apolipoprotein are two types of molecular assembly whose main purpose is to transport lipids through the blood. Lipoprotein is a carrier molecule which transports hydrophobic lipids through watery media including blood and extracellular fluid. It is made up of a hydrophobic core containing cholesterol esters and triglycerides and an outer shell made up of phospholipid and cholesterol. Here, the outer shell is hydrophilic, and it covers the hydrophobic core from the hydrophilic media. Since lipoproteins carry lipids inside them, they are involved in the emulsification of fat. Furthermore, based on the density of the lipoproteins with respect to the surrounding medium, several classes of lipoproteins can be identified. They are HDL, LDL, IDL, VLDL, and ULDL. The structure and function of lipoproteins are as follows. HDL (high density lipoprotein) – contains 33% protein, 30% cholesterol, 29% phospholipid, 4-8% triglycerides and cholesterol esters. It is responsible for collecting fat including phospholipids, cholesterol, and triglycerides from tissues and bringing them to the liver. More importantly, a higher level of HDL in the blood lowers the risk of atherosclerosis; hence, HDL is known as ‘good lipoprotein’. LDL (low density lipoprotein) – contains 25% protein, 46-50% cholesterol, 21-22% phospholipid, 8-10% triglycerides and cholesterol esters. It carries fat molecules throughout the body. Therefore, it directly correlates to atherosclerosis and is known as ‘bad lipoprotein’. IDL (intermediate density lipoprotein) – contains 18% protein, 29% cholesterol, 22% phospholipid, 31% triglycerides and cholesterol esters. It appears in the blood during fasting. VLDL (very low density lipoprotein) – contains 10% protein, 22% cholesterol, 18% phospholipid, 50% triglycerides and cholesterol esters. It carries the newly-synthesized triglycerides from the liver to the adipose tissue. ULDL (ultra low density lipoprotein) or chylomicrons – contains 1-2% protein, 8% cholesterol, 7% phospholipid, 83-84% triglycerides and cholesterol esters. It carries triglycerides from intestine to the skeletal muscles, adipose tissue, and liver. 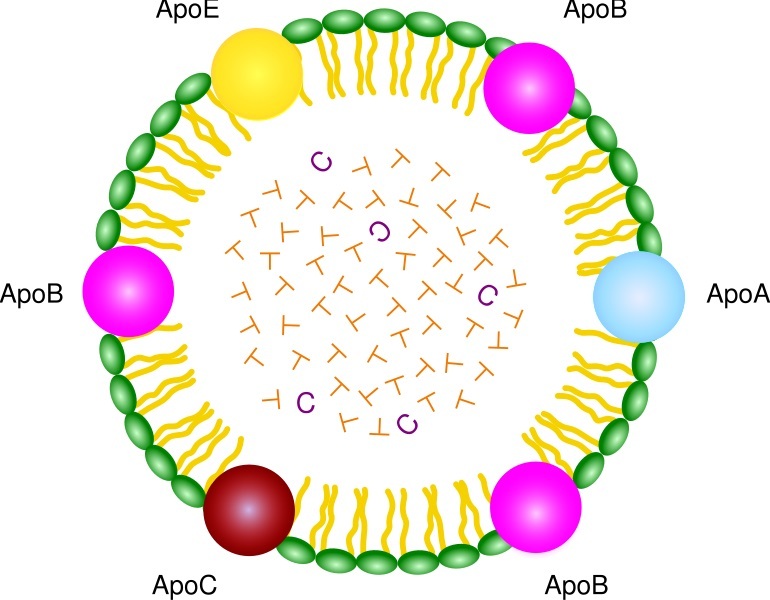 Apolipoprotein is an assembly of protein and lipid in lipoproteins. Therefore, the main function of an apolipoprotein is to serve as a structural component of a lipoprotein, transporting lipids through the blood and lymph. Significantly, the synthesis of apolipoproteins occurs in the intestine and in the liver. Also, this synthesis is regulated by the fat content of the diet and other internal factors. Apart from being a structural component of a lipoprotein, apolipoproteins serve as ligands for the cell surface receptors and cofactors for enzymes. Moreover, several main classes of apolipoproteins occur in the body. They are apolipoprotein A, B, C, D, E, H, L, and apolipoprotein(a). Significantly, different types of apolipoproteins occur in different types of lipoproteins. As an example, the main structural protein component of HDL is the apolipoprotein A-I. Also, apolipoprotein A-IV occurs in HDL, VLDL, and chylomicrons. On the other hand, apolipoprotein E in HDL, IDL, VLDL, and chylomicrons is important in the uptake and transport of cholesterol, and it shows a high affinity with lipoprotein receptors. Lipoprotein and apolipoprotein are two types of molecular assembly, aiding the transport of lipids through the blood and extracellular fluid. They play a vital role in fat and cholesterol metabolism. Also, increased levels of some lipoproteins and apolipoproteins increase the risk of cardiovascular disease while some of them lower the risk. Lipoprotein refers to any of a group of soluble proteins that combine with and transport fat or other lipids in the blood plasma while apolipoprotein refers to the proteins that bind lipids (oil-soluble substances such as fat and cholesterol) to form lipoproteins. Thus, this is the main difference between lipoprotein and apolipoprotein. Another difference between lipoprotein and apolipoprotein is that synthesis of lipoproteins occurs in the liver while the synthesis of apolipoproteins occurs in the intestine and liver. A lipoprotein is composed of a phospholipid and cholesterol outer shell and a hydrophobic core of cholesterol esters and triglycerides while apolipoprotein is composed of proteins bound to phospholipids. Hence, this is also an important difference between lipoprotein and apolipoprotein. 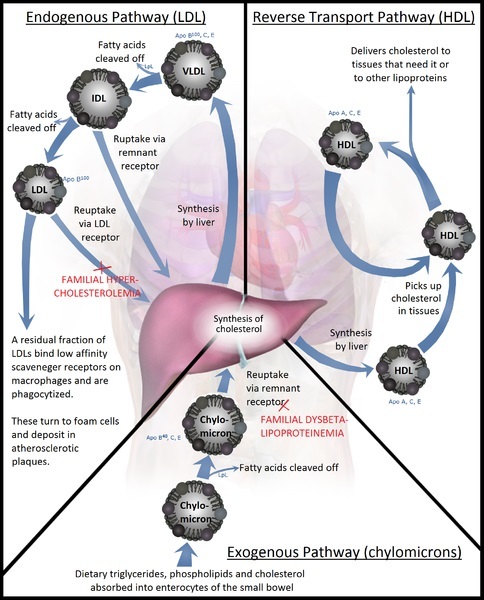 Several types of lipoproteins occur in the blood including HDL, LDL, IDL, VLDL, and ULDL, while apolipoprotein A, B, C, D, E, H, L, and apolipoprotein(a) are the classes of Apolipoproteins. Their respective function creates another difference between lipoprotein and apolipoprotein. Lipoprotein serves as carrier molecules for the transport of hydrophobic lipids through the blood while apolipoproteins serve as a structural component in lipoproteins, ligands for the surface receptors, and cofactors for enzymes. LDL is the type of lipoprotein which increases the risk of coronary heart disease while apolipoprotein B-100 is the type of apolipoprotein which increases the risk of coronary heart disease. Furthermore, HDL lowers the risk of coronary heart disease while apolipoprotein A-1 lowers the risk of coronary heart disease. This is another difference between lipoprotein and apolipoprotein. Lipoprotein is an assembly of biomolecules including phospholipids, cholesterol, proteins, and triglycerides. The main function of lipoproteins is to transport hydrophobic lipids through watery media. In contrast, apolipoprotein is a type of assembly of proteins and lipids in lipoproteins. Also, as a structural component, apolipoproteins serve as ligands and cofactors. Therefore, the main difference between lipoprotein and apolipoprotein is their composition and function.